On August 4, 1914, with Britain’s declaration of war against Imperial Germany, the Dominion of Canada found itself automatically at war also. Immediately the Canadian government began mobilizing an overseas contingent. A wealthy Montreal merchant, manufacturer, and militia officer, Andrew Hamilton-Gault, offered to raise and equip an infantry battalion at his personal expense. To quickly field this unit the decision was made to recruit experienced soldiers and preference given to former British service personnel who had migrated to or were visiting Canada, and other suitable recruits, Canadian or colonial. Hamilton-Gault was granted permission to organize the battalion by the Canadian government and the unit was named the Princess Patricia’s Canadian Light Infantry in honour of the daughter of the Governor General of Canada. The task of organizing and commanding the battalion fell to Lt.-Col. F. Farquhar, formerly of the Coldstream Guards, assisted by the sponsor, Maj. A. Hamilton-Gault, who assumed the position of second in command. The call went out, and within days the P.P.C.L.I. was recruited to full strength. Note position of the title and the lack of a formation patch which dates this photo to pre-1916. Author’s collection. Wishing to unify and instill regimental pride and esprit de corps in the new battalion, Lt.-Col. Farquhar and Maj. Hamilton-Gault sought ways to achieve these ends. 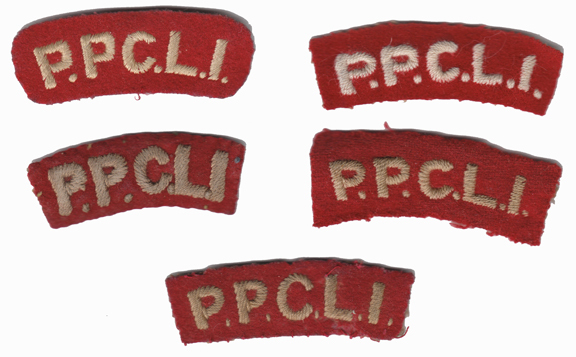 Modelled on the Guards regiments of the British army, the PPCLI adopted many Guards practices. One distinction was the purchase of cloth shoulder titles, like those that had been worn early in the 1900’s by the Coldstream Guards. The P.P.C.L.I. moved to Quebec City in September and prepared to embark for overseas. With the threat of German naval activity, the Royal Navy insisted that the P.P.C.L.I. proceed overseas in the convoy sailing with the first Canadian contingent. The P.P.C.L.I. encamped at Lévis, across from Quebec and waited for the Canadian contingent to be assembled. Obtained from various makers, successive issues of the embroidered titles were acquired by the Regiment during the war. Typically, the titles were constructed on red or scarlet wool with various coloured backing material, usually a heavy weave white or buff coloured cotton with white or buff coloured embroidery. 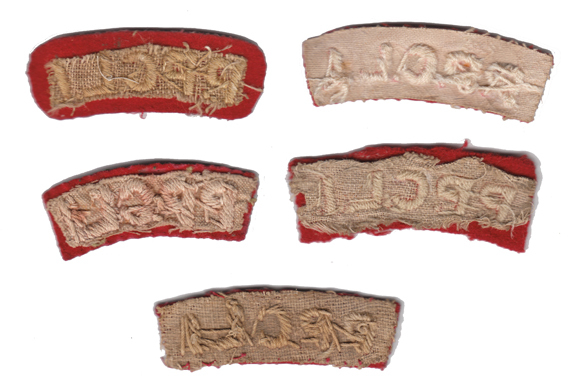 Documentation for the different issues has not been found; the First World War titles were typically embroidered in heavy cotton, showing heavy stitching on the reverse. The title shape varies from a pronounced upwards curve to being nearly flat. Similar construction was used until early in the Second World War, making it difficult to determine the date of titles. Private concerns, such as Gamages, Hemsleys, and other suppliers offered P.P.C.L.I. titles for sale. Of varying quality, these were available to any officer or soldier willing to spend a few pence. Machine embroidered titles replaced the heavy embroidery titles during the Second World War. The P.P.C.L.I. claims the distinction of being the first British Empire battalion to wear embroidered shoulder titles in the First World War. Setting the precedent for other distinctive cloth shoulder titles, the Regiment earned well deserved honours on the field of battle. The white and scarlet title quickly identified them to friend and foe alike. The distinctive P.P.C.L.I. shoulder title continued in wear through the inter-war period, through the Second World War, Korea and up to unification. 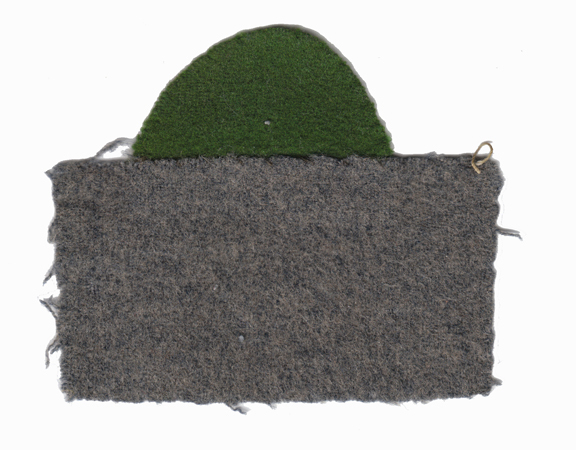 Made redundant by Canadian Forces uniform policy in 1968, it was reinstated for a period of time before it was finally withdrawn from wear on the Army’s green Distinctive Environment Uniform (DEU). In 2013, to celebrate the 100th Anniversary of the Regiment, the P.P.C.L.I. was granted the privilege of wearing their embroidered title on the DEU uniform until 2015. [i] The P.P.C.L.I. claim to be the first regiment to wear embroidered titles in the British Empire. This may be true during the First World War, but embroidered titles were adopted for the British khaki service dress uniform introduced in 1902. The Army Clothing factory records, WO359 – War Office: Army Clothing Department – Register of Changes, show that “Titles, Embroidered, Foot Guards” in white on scarlet were approved on 30th April 1903. They proved expensive and difficult to manufacture and were abolished for the British Regular army at the end of 1907. 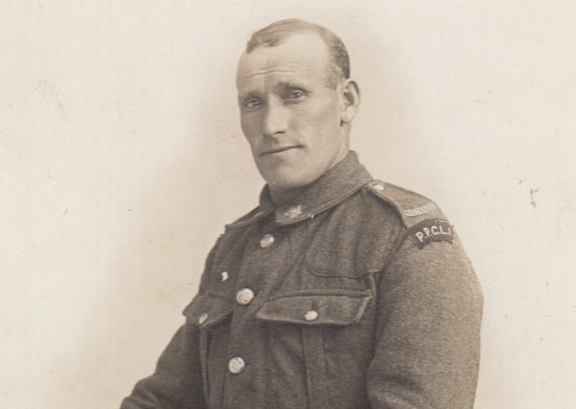 Some British regiments, including the Guards, took embroidered titles into wear again during the First World War. Lt.-Col. Farquhar, a former Guards officer, drew upon his experience with the 1903 titles as the precedent for the P.P.C.L.I. Photographic evidence shows the titles in wear at Lévis in September of 1914. [ii] The post-war dress distinction was authorized for other ranks. It appears officers wore the metal titles on their service dress during the inter-war period. In 1948, the P.P.C.L.I. was authorized to wear a grey backing behind their badges in recognition of their service in 3 Division, Canadian Corps. 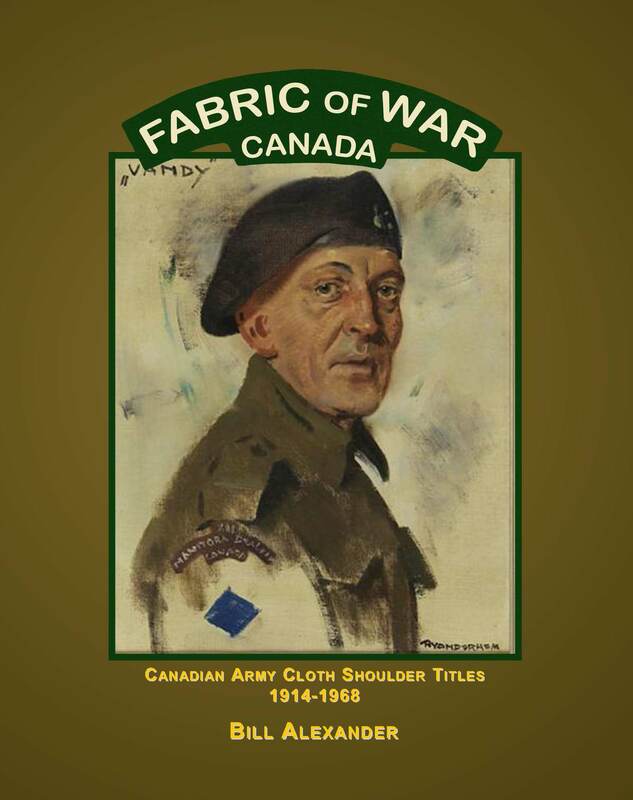 The article’s author is currently working on a complete study of shoulder titles worn by the Canadian Army. Great article. Not mentioned in the article is that the red and white titles were also worn on garrison dress in the 1990’s.